Are you a student, creative, prolife and looking for a way to showcase your talent? Right to Life of Michigan Educational Fund is sponsoring the 2015 Sanctity of Human Life Youth Infographic Contest for high school and college-aged Michigan youth. Contenders who create and submit an original prolife infographic by Friday, January 2, 2015, can participate in the contest. Contestants compete in two divisions based on age, 13 to 17 and 18 to 22. The winner of the 13 to 17 division will win $300, and the winner of the 18 to 22 division will win $500. Right to Life of Michigan President Barbara Listing said, "I want to encourage prolife youth to use their creative talent to promote the sanctity of human life. This contest is an incentive for Michigan students to boldly take a stand for life. At the same time, the infographic submissions will be used to educate others on the precious gift of human life." An infographic is a graphic or visual representation of information, data or knowledge intended to present complex information quickly and clearly. All submissions for this contest must feature a theme which reflects "the reality of 42 years of legalized abortion." Learn more about the 2015 Sanctity of Human Life Youth Infographic Contest. On November 19, Michigan’s Board of Medicine Disciplinary Subcommittee suspended the medical license of abortionist Robert Alexander for 6 months. In order to get his license back, Alexander will have to pay a $75,000 fine and petition the state, something he says he won’t do. For years, Alexander ran abortion clinics in various locations across Michigan until his clinic in Muskegon was shut down by local authorities. WOOD TV8 was there to cover the ruling and interview Alexander who was caught lying on a number of issues. Alexander again attempted to blame prolife people for the horrid conditions of his abortion clinic. Alexander’s latest troubles first came to light in December 2012 after a reported break-in at Women’s Medical Services Clinic. Inside, the city found blood on the floor and walls, uncovered buckets of unidentified fluids in the operating room area, blood dripping from a sink p-trap in a patient room, biohazard bags on the floor and closets, unsecured containers of used hypodermic needles, unsecured medication and patient records scattered around the office, according to records. Alexander at first told the state that Right to Life activists had broken in and caused the damage. He later blamed the former employee. He claimed the bloody instruments had been left behind by another doctor. He also said he was bipolar and blamed his condition for the mess. Planned Parenthood has decided to close its clinic in Ionia, Michigan. The clinic did not provide abortions but did do abortion referrals. In the article, Planned Parenthood cites a dramatic decrease in clients as a reason for the closing. They also curiously claim “decreased funding” as a reason for closing while at the same time mentioning a fundraising campaign which raised more than $4 million. Planned Parenthood is America’s leading abortion provider. Data released by the Michigan Department of Community Health showed a 12.4 percent increase in the number of reported abortions performed in 2013. The total number of abortions performed rose from 23,230, to 26,120. While the increased numbers are tragic, they are not unexpected and have predicted explanations. A law passed in 2012 requiring abortion clinics to be licensed caused 5 abortion clinics to close in the early months of 2013. The location of those closed clinics corresponds with the four counties (Muskegon, Wayne, Macomb, and Oakland) that showed substantial increases in abortions, accounting for the increase in the number of reported abortions. Those closed abortion businesses were suspected of violating the state reporting law. As those abortion businesses closed, their clients went to other abortion businesses; previously unreported abortions may be reported now. There was also a shocking 44.4 percent increase in late-term abortions (after 20 weeks), which may be attributed to better reporting and an influx of women from Ohio after abortion businesses in Toledo closed. In Muskegon, Right to Life of Michigan identified anomalies in past abortion data. The sole abortion business in Muskegon was not reporting abortions for two years prior to being shut down for dangerous conditions. It is suspected that women from Muskegon County are now traveling to other abortion businesses that follow state reporting laws. Metro Detroit may be experiencing something similar, four clinics from that area closed in 2013 following passage of the Prolife Omnibus Act (PA 499). The numbers could reflect an actual increase in abortions, possibly due to the especially difficult economic times Detroit is facing as the city undergoes bankruptcy. About 29 percent of the 2013 increase was reported in Detroit, despite the city having only 7 percent of the state's population. Abortion continues to disproportionately devastate the black community, with more than 50 percent of all abortions being performed on black women, even though they are only 16 percent of the female population. Recent media coverage showing Detroit’s maternal death rate at triple the national rate proves that abortion fails to improve women’s health. The trend of declining abortions committed on girls under the age of 18 continued. That number dropped to under 1,000 for the first time ever. In 2012, 1,035 minor abortions were reported. The reported figure of 971 in 2013 represents another 6 percent decrease. Since 1990, abortions among minors has fallen 75 percent. Whether it is real increases or better tracking, we are deeply saddened by the loss of those additional 2,900 precious lives. While the overall trend of decreasing abortions is encouraging, this year’s increase and the annual overall numbers serves as a reminder that our prolife efforts must continue, because lives depend on us. 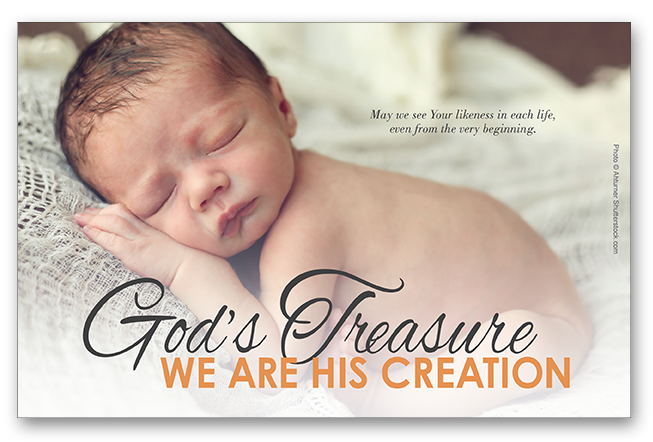 Our 2015 Sanctity of Human Life Sunday bulletin inserts are now available for $7/100. 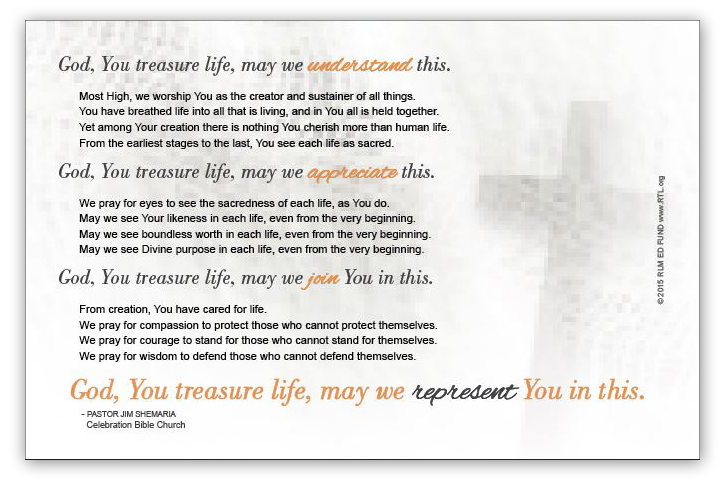 These 5.5" x 8.5" full color glossy bulletin inserts (as seen below) featuring a prolife prayer are perfect for Sanctity of Human Life Sunday church services, prolife gatherings and events. Because of the selfless work of prolife people, the 2014 midterm election saw 86% of candidates endorsed by the Right to Life of Michigan Political Action Committee win their races, a historic result. Highlights include 100 percent of the endorsed candidates for the U.S. House and Michigan Senate winning their races, as well as 90 percent of endorsed Michigan House candidates. The top of the ticket did well, including returning prolife Bill Schuette to the important office of Michigan attorney general for four more years. We have elected prolife people who share our values. Despite huge cash infusions from teacher unions and the efforts of paid election workers, Planned Parenthood Advocates of Michigan endorsed candidates fared poorly, winning only 46% of their races. Planned Parenthood routinely downplays their commitment to abortion, but Michigan voters were not fooled and returned solid prolife majorities to the Michigan Legislature. Prolife volunteers, working hard for free, made a difference in key races, some of which were decided by less than 100 votes. Before the election, Detroit Free Press columnist Brian Dickerson begrudgingly recognized the unique success Right to Life of Michigan has with elections and legislation in the column, "How Right to Life keeps winning in Michigan." Right to Life of Michigan is a grassroots organization that depends on the work of affiliates and volunteers across the state. You are Right to Life of Michigan. Thank you for your efforts this election season! Sadly, Brittany Maynard recently ended her life after receiving lethal drugs through Oregon's assisted suicide law. In Michigan, assisted suicide is illegal. Legalizing assisted suicide really puts the decision of who lives and who dies into the hands of physicians to decide who gets the lethal drugs and who does not. This means the state is granting authority to doctors to decide who is worthy to die. Legalizing assisted suicide, but not providing treatments, like we have seen in Oregon with patients being denied cancer treatment, but will have their suicide drugs paid for, means those states are not serving the best interests of patients. The issue of assisted suicide has largely disappeared in Michigan because of our state's aggressive work on pain management education and access to hospice care. Michigan has chosen the alternative to assisted suicide.